Home » What Is Food Allergy? Food allergy is an abnormal response to a food triggered by the body’s immune system. There are several types of immune responses to food. This information focuses on one type of adverse reaction to food—that in which the body produces a specific type of antibody called immunoglobulin E (IgE). The binding of IgE to specific molecules present in a food triggers the immune response. The response may be mild or in rare cases it can be associated with the severe and life-threatening reaction called anaphylaxis, which is described later in this section. Therefore, if you have a food allergy, it is extremely important for you to work with your healthcare professional to learn what foods cause your allergic reaction. Sometimes, a reaction to food is not an allergy at all but another type of reaction called food intolerance. A description of food intolerance appears later in this booklet. A food allergy occurs when the immune system responds to a harmless food as if it were a threat. The first time a person with food allergy is exposed to the food, no symptoms occur; but the first exposure primes the body to respond the next time. When the person eats the food again, an allergic response can occur. An allergic reaction to food is a two-step process. The first time you are exposed to a food allergen, your immune system reacts as if the food were harmful and makes specific IgE antibodies to that allergen. The antibodies circulate through your blood and attach to mast cells and basophils. Mast cells are found in all body tissues, especially in areas of your body that are typical sites of allergic reactions. Those sites include your nose, throat, lungs, skin, and gastrointestinal (GI) tract. Basophils are found in your blood and also in tissues that have become inflamed due to an allergic reaction. The next time you are exposed to the same food allergen, it binds to the IgE antibodies that are attached to the mast cells and basophils. The binding signals the cells to release massive amounts of chemicals such as histamine. Depending on the tissue in which they are released, these chemicals will cause you to have various symptoms of food allergy. The symptoms can range from mild to severe. A severe allergic reaction can include a potentially life-threatening reaction called anaphylaxis. Generally, you are at greater risk for developing a food allergy if you come from a family in which allergies are common. These allergies are not necessarily food allergies but perhaps other allergic diseases, such as asthma or eczema (atopic dermatitis). If you have two parents who have allergies, you are more likely to develop food allergy than someone with one parent who has allergies. An allergic reaction to food usually takes place within a few minutes to several hours after exposure to the allergen. The process of eating and digesting food and the location of mast cells both affect the timing and location of the reaction. Eosinophilic esophagitis (EoE) is a newly recognized chronic disease that can be associated with food allergies. It is increasingly being diagnosed in children and adults. Symptoms of EoE include nausea, vomiting, and abdominal pain after eating. A person may also have symptoms that resemble acid reflux from the stomach. In older children and adults, it can cause more severe symptoms, such as difficulty swallowing solid food or solid food sticking in the esophagusfor more than a few minutes. In infants, this disease may be associated with failure to thrive. If you are diagnosed with EoE, you will probably be tested for allergies. In some situations, avoiding certain food allergens will be an effective treatment for EoE. If you have a life-threatening reaction to a certain food, your healthcare professional will show you how to avoid similar foods that may trigger this reaction. For example, if you have a history of allergy to shrimp, allergy testing will usually show that you are also allergic to other shellfish, such as crab, lobster, and crayfish. This is called cross-reactivity. If you have a food allergy, there is a chance that you may experience a severe form of allergic reaction known as anaphylaxis. Anaphylaxis may begin suddenly and may lead to death if not immediately treated. 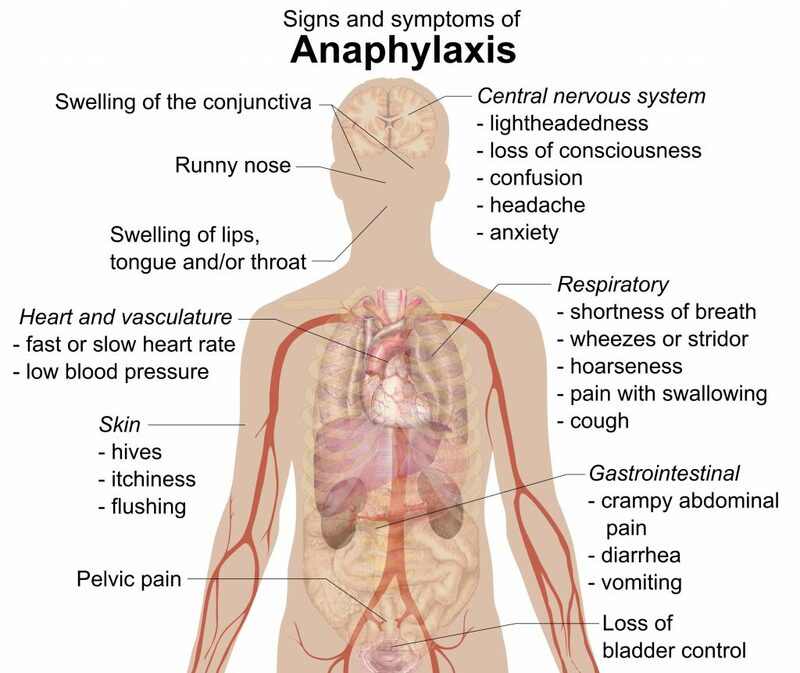 Anaphylaxis includes a wide range of symptoms that can occur in many combinations. Some symptoms are not life-threatening, but the most severe restrict breathing and blood circulation. Many different parts of your body can be affected. Symptoms may begin within several minutes to several hours after exposure to the food. Sometimes the symptoms go away, only to return 2 to 4 hours later or even as many as 8 hours later. When you begin to experience symptoms, you must seek immediate medical attention because anaphylaxis can be life-threatening. Any anaphylactic reaction may become dangerous and must be evaluated by a healthcare professional. Food allergy is the leading cause of anaphylaxis. However, medications, insect stings, and latex can also cause an allergic reaction that leads to anaphylaxis. 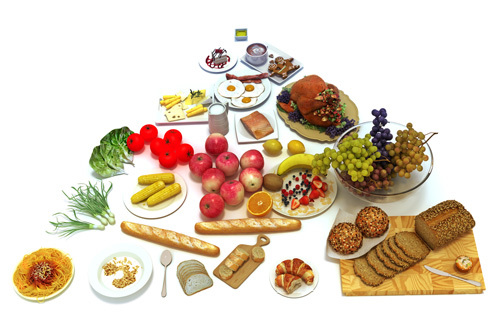 Food allergies generally develop early in life but can develop at any age. For example, milk allergy tends to develop early in life, whereas shrimp allergy generally develops later in life. Children usually outgrow their egg, milk, and soy allergies, but people who develop allergies as adults usually have their allergies for life. Children generally do not outgrow their allergy to peanut. Finally, foods that are eaten routinely increase the likelihood that a person will develop allergies to that food. In Japan, for example, rice allergy is more frequent than in the United States, and in Scandinavia, codfish allergy is more common than in the United States. Food allergy is sometimes confused with food intolerance. To find out the difference between food allergy and food intolerance, your healthcare professional will go through a list of possible causes for your symptoms. Lactose is a sugar found in milk and most milk products. Lactase is an enzyme in the lining of the gut that breaks down or digests lactose. Lactose intolerance occurs when lactase is missing. Instead of the enzyme breaking down the sugar, bacteria in the gut break it down, which forms gas, which in turn causes symptoms of bloating, abdominal pain, and sometimes diarrhea. Your healthcare professional can use laboratory tests to find out whether your body can digest lactose. Another type of food intolerance is a reaction to certain products that are added to food to enhance taste, add color, or protect against the growth ofmicrobes. Several compounds such as MSG (monosodium glutamate) and sulfites are tied to reactions that can be confused with food allergy. They have been added to increase crispness or prevent mold growth. They occur naturally in the food. They have been generated during the winemaking process. Sulfites can cause breathing problems in people with asthma.The Food and Drug Administration (FDA) has banned sulfites as spray-on preservatives for fresh fruits and vegetables. When sulfites are present in foods, they are listed on ingredient labels. Gluten is a part of wheat, barley, and rye. Gluten intolerance is associated with celiac disease, also called gluten-sensitive enteropathy. This disease develops when the immune system responds abnormally to gluten. This abnormal response does not involve IgE antibody and is not considered a food allergy. Some of the symptoms of food allergy, such as abdominal cramping, are common to food poisoning. However, food poisoning is caused by microbes, such as bacteria, and bacterial products, such as toxins, that can contaminate meats and dairy products. Fish, such as tuna and mackerel that are not refrigerated properly and become contaminated by bacteria, may contain very high levels of histamine. A person who eats such fish may show symptoms that are similar to food allergy. However, this reaction is not a true allergic reaction. Instead, the reaction is called histamine toxicity or scombroid food poisoning. Several other conditions, such as ulcers and cancers of the GI tract, cause some of the same symptoms as food allergy. These symptoms, which include vomiting, diarrhea, and cramping abdominal pain, become worse when you eat.